Love the comments on the last post about So Bong. Is she a miserable person caught up in an emotional situation or an emotional person caught in a miserable situation? Does that sentence even make sense? Whatever is going on with her, I think we can all agree that she is one big ball of feelings that will give our robot a crash course in the human world. I see lots more hugs a coming. 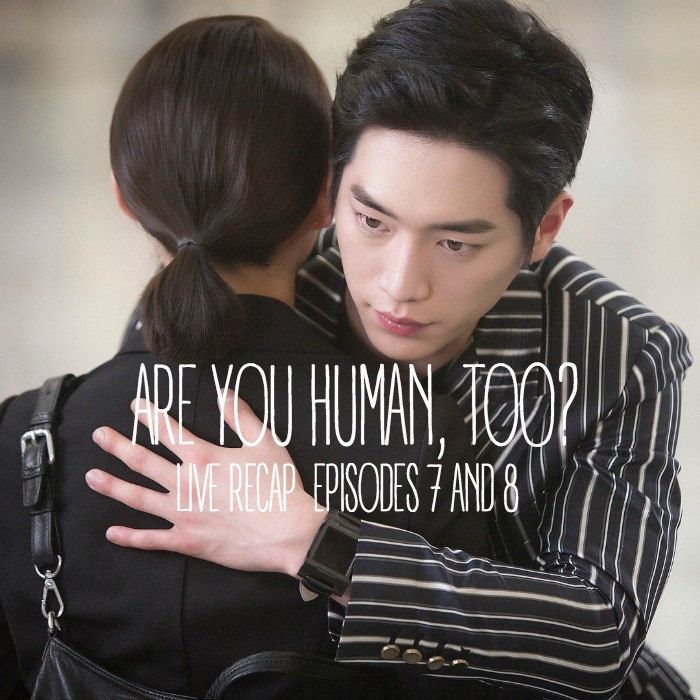 Due to the super long hiatus that Wok of Love is on, we are moving Are You Human, Too to the aftercap spot after About Time. Not sure if this will be a permanent thing or not. We will probably have a line-up shake up at the end of the month depending on the interest level in the shows. Hopefully people don’t lose all their interest in Wok of Love. For the Wok of Love peeps, we think the next airing of Wok of Love is on June 25th. It is not airing due to the World Cup. SB runs to the garage at the house and hops into one of the cars. NS3 watches her leaving and wonders where she is going. He also hops into a car and follows her. She gets out at the hospital and barely misses Umma walking right past her. But NS3 notices her as he gets out of the car. he thinks back to all his recent images of his mother, including her crying when she saw Shin bleeding on the ground. He remembers her saying that he had to go to Seoul and protect Shin’s spot. He hurries inside. Inside, he watches Umma and YH talking with the doctor. He thinks back to YH telling him that he will let him see his mother soon, so why did he lie to him? Then NS3 goes out to the roof and sees that SB saw Shin’s face. He hurries over to her and takes her attention away from it. SB tells him that that guy looked just like him. NS says he did not see that, that is B.S., why are you here? SB tries to think up and excuse and says that she just heard YH’s phone call to meet Shin and she didn’t’ see him so she thought he went to the hospital to meet him. He holds her hand and his eyes blink. he tells her that she is lying. he asks how he knows, is his hand a lie detector? he asks her how she knows. YH shows up at that moment and starts talking to them. He asks why he saw two cars. She tells him that they came separately. he tells SB to go back and for Shin to go with him. SB watches YH and Shin walking away. Shin goes to get in the car but YH closes the door. He tells him that he should have called him if he knew that SB was following him. But then he says that he didn’t give him an order to do that so that is his fault. NS3 asks him why he lied to him. He told him that he was going to the company, but he came to the hospital and met his mother. Can he trust him or not. YH tells him that he is mistaking something, he is not the real Shin, he should just do what he tells him. YH opens the door but Shin shuts it. YH asks him why he did that. Shin says he is copying what he did because he has something important that he wants to tell him. SB also saw the human NS. Cut to SB telling JG that she saw a human NS int he emergency room and then another nam Shin. JG asks where the woman in the picture is. She says she does not know, she just saw that guy. JG says it is nonsense, he does not have a sibling. SB thinks it could be nonsense. JG tells her that she did a good job and he will send her the money. He also tells her not to concern herself who that woman is. They hang up. JG talks to Park about why Oh Rora is in town, what are they planning? YH and NS3 get home. They both get out of the car but YH tells NS3 that he should wait for him to open the door! they practiced this in Czech. NS3 happily gets back in the car and lets YH open it for him. Inside, YH talks with Sb about what happened today. SB says that she just wanted to do everything to keep her job and overheard his phone call. It seems like he was going to meet NS so she followed him to get recognition from NS, but she says a patient that looked so much like NS, that is nonsense right? He tells her that he wishes someone like that existed and she should jsut focus on her bodyguard job. he leaves. She breathes a sigh of relief. At the hospital, HJ and Mom think about seriously moving NS. HJ does not want to because Shin is in critical condition, but HJ thinks they have to. At home, NS3 listen to a voice mail. it looks like he tries to call someone but it constantly goes to voice mail. he looks at the pictures on his camera of his mom and little Nam Shin. He goes outside by the pool and continues to look at them. He puts his phone by his side and looks out over the pool. SB also walks around and looks at what NS is doing this late. he is just floating in the water. NS3 floats in the water and then sinks to the bottom. SB just shakes her head an walks away. But she looks back when it looks like he is not coming up. The camera cuts underwater and we see NS3 just floating underwater and not moving. SB runs to the side and tries to get his attention, but he is not moving so she jumps in and grabs him. Her necklace falls to the bottom. he stands up and is fine so she yells I WORRIED ABOUT YOU. He grabs her hand and tells her that she is truthful this time. Her heart beats hard as he holds her hand. She shakes her hand away and yells at him, why are you standing in the water! you might die! he tells her that she is the one that might die, her heart is about to burst. YH comes out to them and tells them to stop playing in the water and change your clothing first. They both get out and walk inside. SB goes to her room, but she thinks about Nam Shin and waht he said to her about telling him the truth now. She tries to shake it off but her heart starts beating hard again. She tells it to stop. STOP! then she looks at her camera and starts to watch YH and Shin talking. YH is upset at Shin and tells him that he told him to stay insid his room, why was he in the water! Just behave like Shin. he touches his shoulder. SB hears the voice as well and wonders why YH would tell Shin to behave like Shin. What is going on? She calls reporter Jo to investigate something for her. Shin gets in his car with YH holding the door open for them. Then SB goes up to YH and holds his door for him. they start driving to work. Everyone waits outside as Shin gets to work with everyone else. They all bow as the chairman, daughter, and grandson stand at the doors awaiting to go inside. YN is there as well, she is mesmerized with Shin and only looks at him. She is reprimanded for it but asks why she should look at anyone else? The entire team meets to talk about the automatic driving car. the conversation turns to the fire and whose fault it is. Chairman tries to get the conversation back to the car. Shin says he will be successful so give me your seat. He is confident that he can make it commercial in 3 years. So give me your seat. Shin says that he is not the Shin from before, he does not want anyone to take soemthing that is his, perhaps he has his blood. the chairman is happy and tells him that he is greedy now, that is a good thing. His seat…when he is succesful then he can take his seat. Lets end the meeting. they leave. JG tells Shin that it is good to see him so confident. he should be like this often. YN tells him that she changed somthign in his office (?) and speaks to him very happily and brightly. She wants to go see it with him. But YH tells her that he should go home. YH tells Shin that he did a good job. But NS3 wnats to know what would happen if human Shin does not wake up. Will he be the CEO? YH says he should wake up. Shin is more importnat than himself. NS3 does the lie detector thing on him. YH ask him if he thinks he is lying. NS3 thinks for a moment and says that it was a joke. Then he walks off. YH looks at his hand and then looks at NS3 walking away. Meanwhile, SB waits outside for everything to end. Jo sends her a message, she snuck out CCTV footage from the hospital. SB starts looking at it. JO calls her and tells her that she is in the hospital. She is not sure who the patient is, but the woman is the guardian, she wonders if that patient is the patient she mentioned. SB tells her that YH told her Shin to behave like Shin. JO thinks that means her Shin is the fake Shin. Umma starts to walk the hall so JO hides and tells SB that it is wierd, is this a fantasy movie? How can you have two Shin’s. SB tells her that she will be there, just check the face and call her after 30 mintues. NS3 gets to the car so she opens it for him. She walks around the back and texts someone. Inside, JG thinks back to Shin ruling that meeting and says that he does not want anyone to take what is his. JG throws something on the floor in a rage. Park is concerned, but he still approaches him and shows him the photo of the doctor, Yh, and Umma at the hospital. They think that Umma is the head of whatever this plan is. YH is the arms and legs. But it is fine because he can take care of them all at one time. SB drives Shin back with him sleeping in the backseat. She tells him that he looks different than before. He rescued her and joked with her and was kind. Shin opens his eyes and asks her if she thinks he is not Nam Shin? he was kind to her so she suspects him. Should she hit her in the head one more time? She says no. He tells her to be quiet and drive. they get to the house. SB runs around to open his door for him then seh gets a call. it is from JO but SB pretends like it is from her appa. JO says that she is using her camera now (super big papparazzi camera). SB says Appa, I am working now! Cut to SB apporoaching NS, she asks him if she can go to the hospital to see her appa, he got injured. You can hold my hand if you don’t believe me. But he tells her that she can leave and take his car. She leaves which make shis face turn back into the happy NS instead of the stern Nam Shin. He greats his little vaccuum robot friend. Hello, Chingu. SB gets in the car and checks the toy CCTV footage that shows Shin looking at the robot vacuum. She smile and puts it in the passenger seat. David, YH, Umma, and the doctor all sit around Shin’s hospital bed. They talk about a certain organization helping them. David thinks Shin should have some sun, so he open the window. JO is right there and thinks this is successful. She takes a couple long range shots and is shocked at the results. She shows the pictures to SB and says that seh is right, there are two nam Shin’s. he is still at home right? SB calls JG right away and says that he found the umma and the Nam Shin body double. he tells her that Shin does not have a body double, there is no other Shin. But SB says she is right, she will check it and let him know. SB tells JO to stay outside while she goes in. She walks around to the room and takes a breath as she is about to go in. Sb goes into the room. Somehow, no one is at the door or inside the room. She wlks into this huge room and looks around. Then she turns the corner and sees nam Shin lying in bed. She walks right up to him and waves her hand over his face. he grabs her hand and then sits up. He asks her what she is doing. YH comes out of the back and wants to know how she is there or what she is doing there. SB quickly calls JO but pretends like she is talking to her appa. JO tells her that NS is not at home anymore. SB turns around and tells SB that seh came there for her appa but the nurses told her that NS is there. YH tells her that he wants to talk to her for a moment. He pulls her to the side and tells her that NS was in a car accident and is starting to behave stranely like hug people and hold there hands. But they want to hide it because it will be a big deal if the media knows about this. SB thinks when YH told Shin to behave like Shin is was just a simple thing of him behanving like himself. SB asks who that woman is. YH says it is Shin’s mother, she came in secretly from another country. Please pretend like you dont’ know anything. SB smiles and says that she will pretend not to know anything, she should as a body guard. SB walks out in a daze. JO walks behind her and says this was the first time she got to use this big camera. In the room, YH and Shin talk as Shin dresses. he says that she left, he was a good actor right? YH asks him how he knew that she would come. Shin says that he knew about the camera in the room. He hacked the smart pad so he could see her and figure out her motive. he drove his motorcycle to the hospital and cut around all the cars to get there before SB. YH ask shim to tell him these things as soon as he knows about them. Especially with the hidden camera. YH says that SB knows everything that they talked about. He heard what YH said and will be suspicious. today his decision is better, humans are not comparable to his recognition abilities. If he stayed home like YH wanted, then what do you think would have happened? YH tells him to ignore the hidden camera for now. they don’t know if she did it herself or if she has someone behind her and they want to figure that out. YH calls his friend, HJ and asks him to find out who is behind SB. HJ is all like, how can I know that? YH tells him to ask all the nurses and everyone. Then he hangs up. Umma asks who is behind whom? HJ tells her it is the bodyguard. JG tells SB to stop doing all that nonsense stuff, he told her that he does not have a twin. SB lets him know that the umma just worried about the son due to car accident trauma. JG mentions to Park that he really did have a car accident. Then he tells SB to check NS’s condition with her hidden camera, tell him when she has evidence. David playfully tells Oh Rora that he can work everywhere. Then the conversation turns to NS3. HJ cant believe that a robot can grow up. NS3 calls Umma and tells him that their plan worked. He also says that they should go home now. NS is back, so they can go home. But Umma tells him that Shin is sick so she has to stay with him. NS3 says he is Shin also. Umma tells him that she understands, they will go home soon. David yells from the back that he misses him. The little robot whirrs to get NS3’s attention. NS3 tells him that he is okay, his umma told him that he can go home soon. But when a human says soon…..how long is it? SB drives home. Her appa calls her but she does not take it. then she gets a photo text and pulls over. It is a Jesah memorial. It looks like it might be her Umma’s Jesa memorial? SB calls her Dad ans asks her why he is sending that picture to her. It looks like she forgot about her mothers memorial. Appa tells her that she isnt’ taking his phone calls and forgets her Umma’s memorial, she is a bad girl. SB is pretty upset and remorseful, she touches her neck and realizes that her necklace is gone. Cut to the house. NS3 looks at SB looking at the pool. He walks up to her acting like NS and asks her waht she is doing. She says that she is looking for her umma’s necklace, it is the last thing she gave her. NS3 immediately understands and covers SB’s eyes. then he turns on all the lights in the pool area. he removes his hand when he is done. She asks why he covered her eyes. he motions for her to look at the pool where her necklace is shining. he tells her not to lose it anymore or her Mom will be sad. he wlaks off. SB quickly tells him that she is sorry. DOn’t ask her waht she is sorry about. She is just sorry. He smiles and says that he does not have to hold her hand to know that she is telling him the truth. He is thankful that she told him the truth. She goes inside and looks at her tablet with the camera then throws it away in the trashcan. JG is introduced to a young hacker that can hack into a car and drive it himself. JG tells him that he wants to show how dangerous automatic cars are, a lot of people should get hurt and scared so people know how bad it is. He also wants NS to get hurt. Every key figure sits around a round table to talk company business. JG tells the chairman that a lot of reporters are around, he feels good and thinks that automatic driving is not that far away and could be their biggest business. YN asks if they can clear their presonal life and arrange their marriage already, it will be good for the company. HY is sarcastic and says that is a good theory. Then it is time for NS to go to the car and for everyone else to watch from the office. YH tells NS3 that he will watch with the chairman. he gets a call from HJ, a reporter asked a nurse about the patient. While walking out. SB walks with NS, they will drive together since she is the bodyguard. She thinks back to what Shin told her about not losing her necklace again or her mother will be sad. She looks at Shin in a caring way. Shin also looks back at her as if he wonders why she is looking at him like that. Outside, NS3 sees the car and smiles happy at it. (Perhaps because it is another AI friend?). Meanwhile, YH meets with JO. She says it wasn’t her, why would she go there? YH says it is because she is the friend of SB’s. If no one is behind SB then her life is done. If she did all of this by herself then she will have to pay for it. This time we will not stop at just not letting her get a job. JO immediately says that they have someone behind them. Back to the AI event. the AI car drives up. Everyone claps. It is definitely a moment as the car rounds the corner to applause. David thinks NS3 will be happy if he knows that she is there (Umma). Umma thinks this situation will have a lot of variables, so she just wonders how he will handle it. YH calls NS3 and tells him that JG is behind SB, so be careful, dont’ talk to her too much. NS3 tells him not to worry. SB is steady looking at Shin as if he is a fallen angel. they both get into the car. JG tells the chairman that it is daebak, congratulations in advance. Cut to the hacker doing his hacking thing with like 3 computers in front of him. the automatic car drives along the street with NS3 and SB behind the car. SB tells NS3 that she will just work until today and seh is sorry for being irresponsible. She will find someone else to watch him. He asks if this is about the hidden camera. SB is shaken and actally swerves the car. NS3 holds the steering wheel. But then SB says that the car is accelerating all of a sudden. Umma feels that there is a problem. YN is the first in the conferene room to see that there is a problem. the car goes wild and starts to hit a lot of other cars and push them off the road. there is a person in the car who asks what he should do, he will try to do something. he unbuckles his seatbelt and hops in the front seat. But he is thrown from the car. The hacker happily tries to run over as many cars as possible. In the audience, Umma gets up to do something, but David tells her not to do anything or people might find out about Shin. NS3 sees all that is foing on and controls the car with his own abilities. he is fighting with the hacker in control of the car as SB tries to keep up with the car. But it is a challenge because this car is really on the rampage. NS3 tells her that he has to press the kill switch so he needs to get in the car. He opens the sunroof. She asks him if he is crazy aren’t you afraid. He tells her that he has no emotions he doesn’t know those feelings. he hops on the car and stands for a moment. Then he hops over to the AI car and lands on the roof. he fips himself into the car like Jacki Chan. But the car is still driving around like crazy so SB is still having a hard time driving behind them. NS3 is about to press the kill switch, but he is also thrown from the car and is dragged for a moment. But he manages to hop back inside and get behind the wheel. he presses the kill swith and stops the car just in time to keep it from hitting a huge truck. SB gets to him and asks him if he is okay. But she sees his robot body that was exposed from him being dragged by the car. She is shocked. SB – He is not a human. SB – Everyone is crazy! What if I just tell everyone! Umma – Shin should not be close to the automatic driving car. Block him from getting close to it. Chairman – Shin, you should prepare to get married. YN – I just need Oppa. SB – I can’t (live like this). NS3 – Don’t leave, please help me. SB – Stop pretending to be a human next to me! Every time I see your tagline I think I must be obsessed. To be checking your website multiple times a day for comments. The girl is not so annoying today. The hour passed by too quickly. How can I wait another week to see if he’s found out? Wish they touch more on his abilities. Is he learning to be as devious as his fellow human beings? To be more calculating? What does he want? Is he programmed to love his mom lots or did he self learn emotions? So many questions! You know, you bring up a good point. Perhaps he is learning how to be a bit calculating and slightly manipulative just like the humans around him are. I also wonder about his feelings for his mother, was that a programmed our learned trait? He seems to really enjoy spending time with other robots, so that kind of makes it seem like he understands likeness or emotions a bit? I wonder what it meant went he checked YH to see if he was lying? Is he learning to question everyone around him? It seems like he won’t trust YH in the near future. I also love how NS3 is picking up tiny things, like closing the door on YH when he wanted to make a point. He only did that because YH did it to him and it proved effective. I also did not think she was annoying today. the necklace/mom thing really hit an emotional chord for her. She almost looked at NS3 like he was a Saint and as if she had him pegged all wrong. Now she will have to deal with her feelings for falling in love with a robot. I think she will try to deny it as much as possible but her heart does not lie.